One of the newest saddles in the Tucker line is this old time style saddle. The Old West Trail Saddle has the same quality and comfort you expect in a Tucker saddle together with the appealing classic look of days gone by. 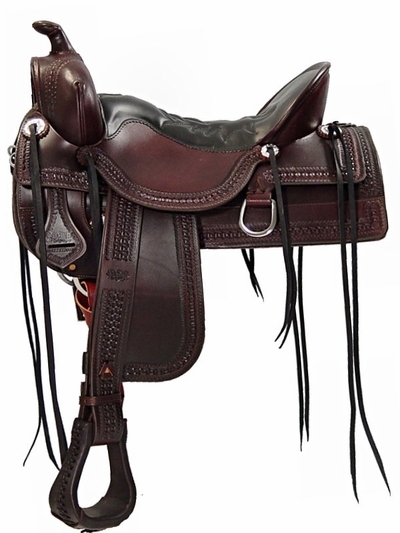 The Old West saddle is unique in the Tucker line with double skirting, a 2" stirrup leather over the fender, rope roll swell front, slotted silver conchos with black strings, a two-piece seat jockey and a black seat. The tooling pattern is available only on this saddle. The Old West saddle is western dee rigged and has 3� tread leather lace bell bottom stirrups. Ride the west in comfort in the Old West Trail Saddle. Tucker Saddelry's Gel-Cush Shock Absorbing Seat provides trail riders with Ultimate Trail Comfort. Tucker begins the saddle seat construction by building into the tree a ground seat that gives with a rider's weight. Unlike other saddle brands, Tucker's flexible ground seat, when attached to the patented Durahide tree, creates a foundation unequaled in comfort for long hours in the saddle. The saddle craftsman then adds the latest in comfort gel technology to the ground seat. Tucker's Gel-Cush Shock Absorbing Seat is not susceptible to heat or cold, and there is nothing to ooze or leak out. It is a superior material that adds minimal weight to the finished saddle. All the components together make a Tucker Trail saddle unequaled in comfort.